Nero is a German software giant with footprints in CD DVD burning software .Nero showtime is Windows based player packed with Nero premium edition .But many us don’t know about the mobile version of Nero showtime player .Nero mobile currently available only for PDAs or smartphones equipped with Windows mobile OS . 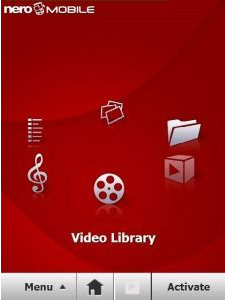 Nero mobile mobile plays music ,video and sideshows in a better quality than that produced by the default Windows media player . Unfortunately Nero mobile is is shareware application . But for test you can download a 30 day trial version of the application here . Nero mobile center actually looks like a media center .Here you can opt to browse folders , play music ,videos or image sideshows .Nero mobile has the capability to play the media file to the full screen and to the full sound and clarity . It support viewing of high definition movies and images files . Further you can extend the possibilities of Nero mobile by connecting your mobile phone to TV ,computer or projector through TV out cable . Nero mobile player is free for first 30 days , Thereafter you will need to pay 20 USD per license .